Dealing with a divorce is never easy – especially when the struggle is not only against your partner, but also navigating the legal system. Unfortunately, this is the situation that so many divorcees find themselves in. With many family solicitors charging up to (and sometimes even over) $600 an hour, self representation in court often seems like a much cheaper and acceptable solution. However, this path is also fraught with challenges. Chief amongst them is the legal system which often is confusing to people who do not have experience in dealing with it. Family lawyer Robert Larkins can recount cases where self represented litigants were unsure about how to cross-examine, negotiate with a lawyer or draft affidavits. In addition to this is the often overwhelming experience of standing up in court to present one’s case. It is no wonder then that self represented litigants find themselves in such a tough position if they do decide to self represent. On top of all the legal issues associated with self representation, there are also personal ones too: a protracted divorce period, emotional strain on any children involved and a “win at all costs” mentality that tends to bring out the worst in people. The easiest way to avoid this situation is to settle outside of court, with many agreements being reached for under $1,000. Research from the Australian Institute of Family Studies suggests that 43% of separating couples were able to devise a settlement within a year of their relationship dissolving. This suggests that reaching an agreeable solution is possible, and indeed something that divorcees should strive for. Mediation between both parties is often a useful avenue to explore, with many lawyers or organisations such as Relationships Australia offering these services. The key point to remember in any negotiation, says Robert Larkins, is that an irrational approach where expensive legal battles are had over “the principle” and in place of any firm financial sense are rarely successful. Access guides produced by the Family Court. These include advice on how to appear in court, basic explanation of procedure, online brochures and fact sheets. Consult guides written by experienced lawyers, such as “Breaking Up – A Self Help Guide to the Courts and the Law” by Robert Larkins, or factsheets from Family Law Express. Contact sources of free legal support such as community legal centres or Legal Aid. Continually be open to the option of settling out of court to avoid continuing an already drawn out process. 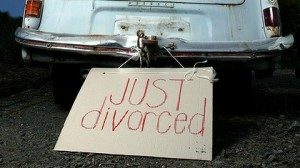 Above all though, court divorce cases should be a last resort, especially if legal representation is not an option.